Is your recycling team ready to win in 2019? Recycling for REAL: The question “for REAL?” required the absolute truth, or a severe penalty. The question still applies today in the arena of public space recycling. Recycling for REAL is a transparent system that delivers 90% plus of available recyclables with minimal contamination. Recycling for REAL relies on teamwork. The key to this teamwork is, as always, engaging the most valuable players on your collection team – your guests. The clear bag is the ultimate tool for behavioral change, because people will not throw their recyclables into the trash if they believe others are watching. for positive ECONOMIC ROI and lasting ENVIRONMENTAL Legacy for all. Recycling for REAL is transparent. We are all social creatures and our behavior is shaped by peer pressure. You want your guests to do the right thing and be part of the team. How do you train rookies to become great players? You let them watch other great players! In 2003, ClearStream made its appearance at the NASCAR race in Homestead, Florida, in a pilot project conducted by Anheuser-Busch and NAPCOR. Curbside and public space recycling are natural partners for communicating the values of recycling with a consistent environmental message. The values of recycling taught in schools and reinforced in homes is reinforced when there are guests creating community pride, one recyclable at a time, at public space events. When all 3 bottom lines are in alignment – behavior, revenue and awareness – sustainability is automatic. 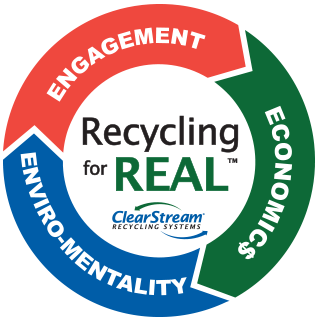 Whether it’s a grass roots inspired movement to start up a recycling program, a reboot of a 75-year-old fair or festival collection program or a large brick-and-mortar public space collection initiative, ClearStream can help you win the game. As always, winning requires engaging the most valuable players on your collection team – your guests. Participation in the PUBLIC collection is a commitment to conserving the planet far beyond the economic value of the materials or the avoided disposal costs. Seeing bottles and cans (and compost if available) piling up in collection containers and the grounds kept spotlessly clean is a teaching moment. It is their collective responsibility and privilege to be caretakers and stewards of the small area on the planet they call home, even for a little while. Join the 10’s of 1000’s of permanent and temporary public space events that rely on the ClearStream system to win.